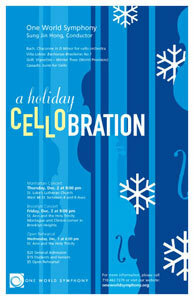 Celebrate the holiday season with One World Symphony cellists and conductor Sung Jin Hong as they present a compelling program for an all-cello orchestra. Brazilian composer Heitor Villa-Lobos's Bachianas Brasileiras No.1 (1932) combines elements of Bach's contrapuntal style with the vibrant sounds of Latin America. Masterfully melding North American jazz, African rhythms, South American folk sounds, and the European classical tradition, Bachianas Brasileiras No.1 convincingly integrates music from four continents -- truly appropriate for One World Symphony. Villa-Lobos, who was himself a cellist, imbued this masterpiece with remarkable complexity, giving it both a sunny and a meditative side. Bach's music is both rejoiceful and reflective, so it is especially beloved during the holiday season. One World Symphony will perform an all-cello orchestration and arrangement (by Laszlo Varga) of Bach's Partita No. 2 for unaccompanied violin. This work probes profound musical, emotion, and intellectual depths that so many composers have arranged for various instruments: two-hand piano, left-hand piano, organ, viola solo, guitars, full orchestra, and cello orchestra. Faithful to its tradition of performing new music by up-and-coming composer, One World Symphony will also perform a world-premiere composition by Stanley Grill, entitled Vignettes -- Winter Trees. This piece is an intimate musical setting, for mezzo-sopranos and cellos, of poems by William Carlos Williams. Stanley Grill was raised in the Bronx, studied at the Bronx House School of Music, and later graduated from the Manhattan School of Music with undergraduate and graduate degrees in music theory. Grill's Vignettes -- Winter Trees functions on many levels, as a reflection on winter and as an introspective exploration of love and loss.